I've been traveling again lately. On one particular trip, I ended up with a more than three hour layover in Bush Intercontinental Airport in Houston. Usually I have between a half hour and hour or so between flights. This was my first long layover in a long time, or relatively so, given that I'm only going across the country. And I wasn't looking forward to it. Three hours is a lot of time to kill. On the up side, it was plenty of time to find a restaurant for a real meal. No rushing. No boxed meal. No eating at the gate, using my lap as a table. But I had to find a restaurant. All of my previous eating experience in that airport consisted of packaged, grab-and-go food. I stopped at a bar that was packed. Normally that is a good sign. I asked to see a menu. Bar food, alright. And it appeared that all of it was fried. I'm not willing to risk eating fried food cooked in a probably-shared frier. So I left and kept walking through the airport. 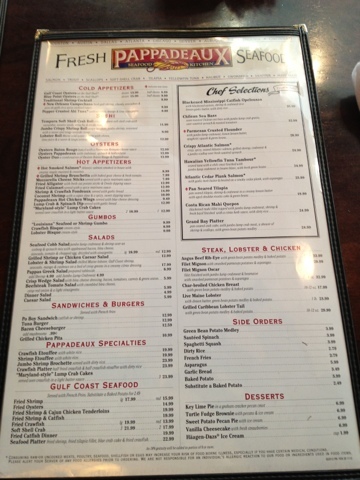 Then I started seeing numerous signs for a French-sounding place that touted seafood. I followed the signs through Terminal E to the area between gates E2-3 and E8-9. Probably cajun. Cajun in Houston? You bet. It would probably be good. So I checked the posted menu before going in. Lots of non-fried options. Check. But could they accommodate my gluten-free needs? There was only one way to find out. I went up the elevator and added my name to waiting list. I didn't have to wait more than about three or four minutes before they had a table for me. I asked the hostess if they had a gluten-free menu. No, but she assured me they would be able to take care of me. My server was very knowledgable and immediately ruled out the recommended buffet and everything fried on the menu. That, already, was two excellent signs that I would eat safely there. I examined my viable options and started asking questions. Salad dressing. Fish. Seafood. And the server left to get answers for me. Before I realized what had happened, I had a manager at my table, providing answers and suggestions for me, while both of us looked at the menu. That was more than I expected, but it certainly served my purpose! She answered all of my questions, even the new ones that cropped up as we discussed additional options available for me. 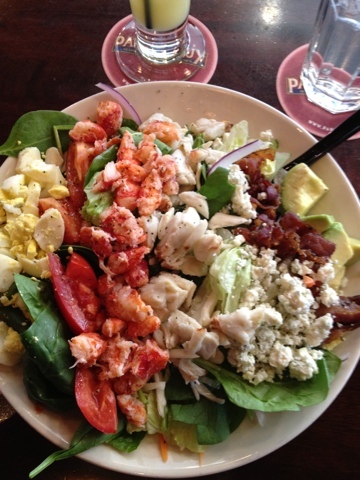 I finally settled on a Seafood Cobb Salad, but I substituted lobster for the shrimp. That wasn't a choice driven by gluten, just my preference. I also ordered blue cheese dressing, which I was assured was gluten-free, on the side. This was perfect for not overpowering the delicate flavor of the crab and lobster. Nice. This salad was fantastic! As in, "I'm a fan!" You can't really tell from the picture, but this salad was deep and far more than I could finish, even in three hours and with a cup of coffee! Everything was delicious and fresh and fabulous. The seafood was superb! You want one of these salads! 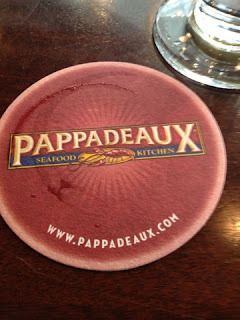 Pappadeaux is a chain of several restaurants in the Houston area, so you have more than just the airport location to look forward to!